It’s been a busy couple weeks here at Reggie’s house. I moved, temporarily, because I had a lucrative offer to rent my home out to a movie producer! Michigan has been offering big incentives to movie houses the past few years and filming and production has increased significantly in our area. We’ve seen several blockbuster films made here (and some not so blockbuster films made here LOL) so movie star sightings are on the rise! Who knew, however, that this would mean my digs would be in a prime location one day for film execs! So the deal was made and Reggie and I had one week to move out. It wasn’t easy, but we did it. So that means now we need a break, we need some fun. Where to? The Dog Bowl of course! 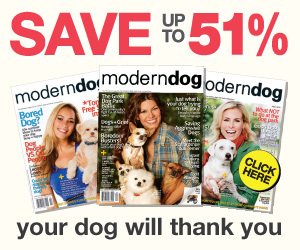 The 4th annual Dog Bowl held in Frankenmuth, Michigan is billed as the Olympics for dogs. 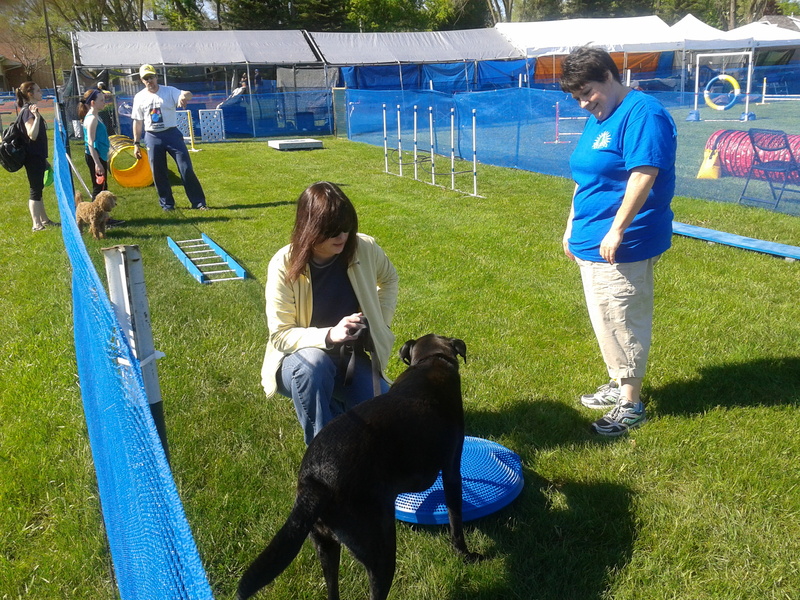 They have events such as the Disc Dogs, Dock Dogs, agility competitions, fun runs (with Dachshunds of course), king and queen of the Bowl, costume contests, vendors and more. If you are a fan of the cable TV show The Incredible Dr. Pol (which is based in mid-Michigan) Dr. Pol, Charles, and Athena were there too! Walking the plank, no problem. Walking the ladder, no problem. The trainer was rather impressed. Reggie just looked at me like ok, I walked it, give me the treat. The BOSU-looking thing was a little more challenging. He had no fear of touching it or the fact that it wobbled, I think he thought he wouldn’t fit on it (funny). He would move to get on it and then walk over it- like I’m too big for this. 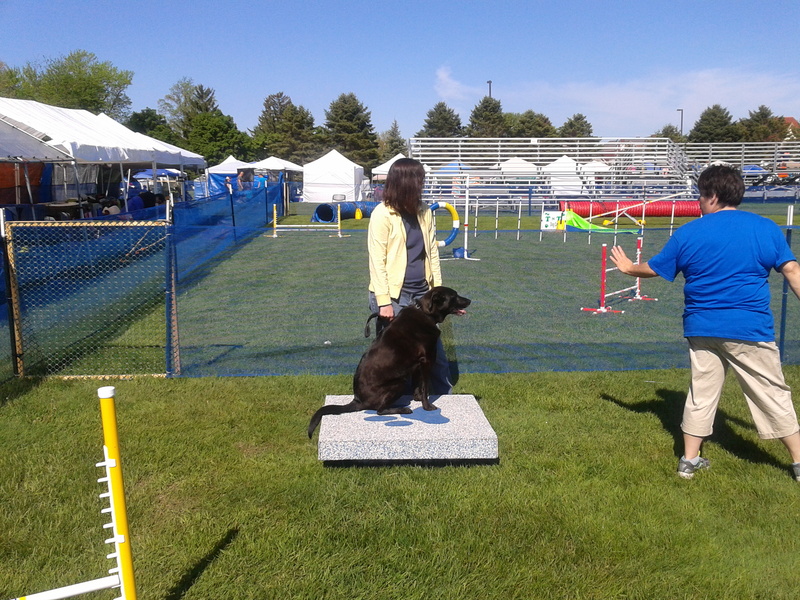 The pause block and the wobble board also no problem he jumped right on them and sat down- impressing the trainer and making me look like an awesome owner. And then it failed. He did not like the tunnel. He wouldn’t even take the treat I threw in the entrance of the tunnel. I crawled in the tunnel so he would come with me. No go. The trainer shortened the tunnel so he could see the other end more readily- nope. And then the weave poles. 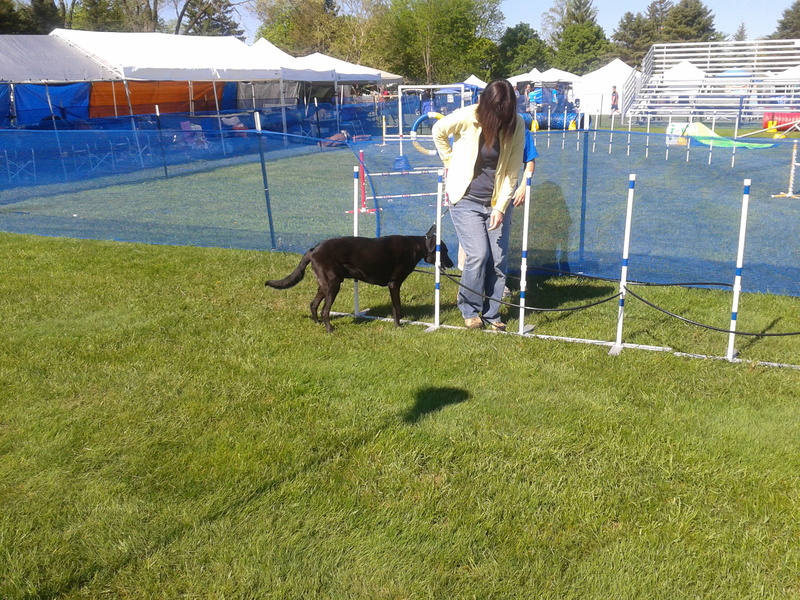 He did not get the poles even though I was leading him with the leash and treats. So then I walked through first (lead-follow) and for some reason that freaked him and he bucked and took down the whole weave pole system! Whoops…The trainer laughed, I was concerned and a bit embarrassed. 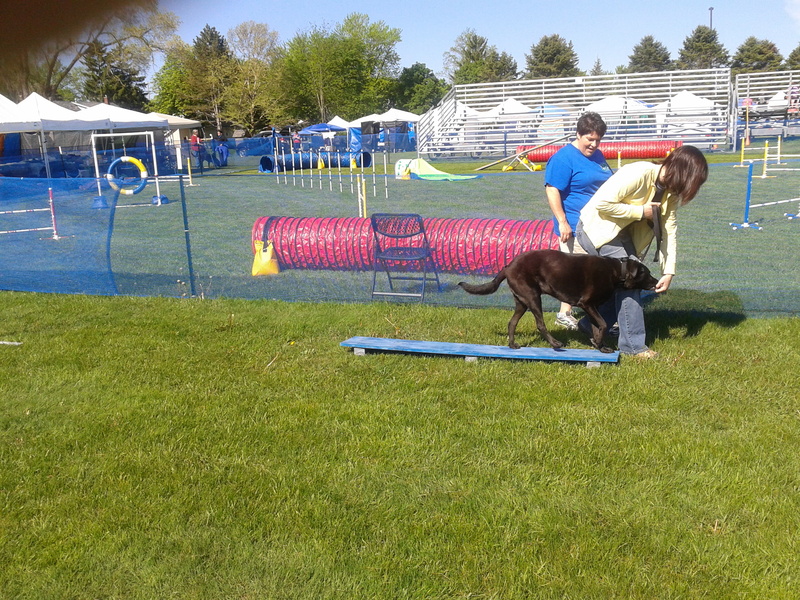 The only other obstacle was the limbo bar and he didn’t jump but looked at it, the treat, and then just stepped over it. Comical. At least he went, and he didn’t knock it down. 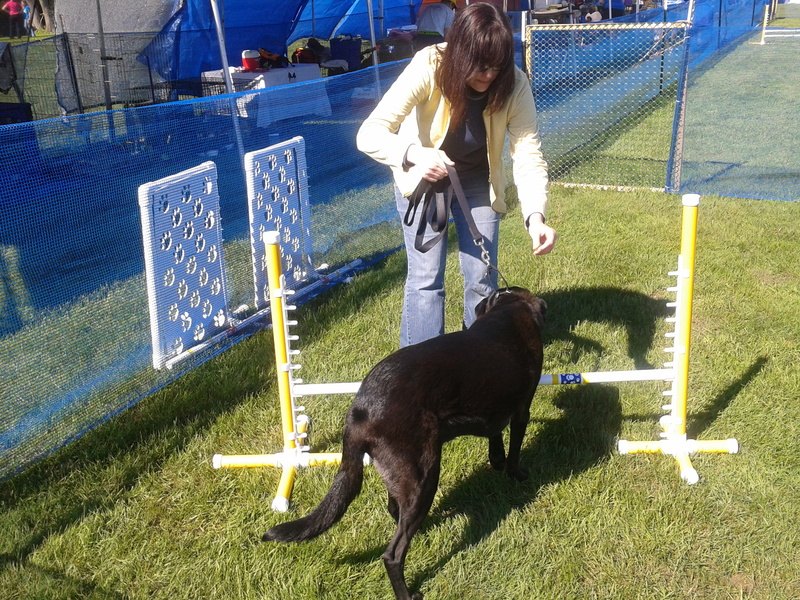 Overall some agility obstacles he was a total first-time champ at, others not so much. He would never be a time winner (hence why I was looking for a fun club not a competition club) but the mental stimulation for these dogs we were watching during the competition is unbelievable! 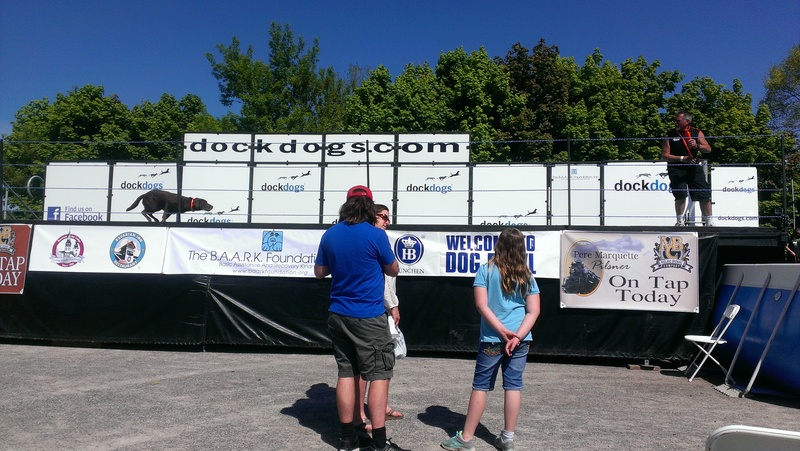 The Dock Dogs was another unbelievable group of canine athletes. And, another group I’d love to get Reggie into but there is no formal club in Michigan. Reggie was straining at the leash watching these dogs race off the dock into pool. He does this up north on his own maybe I should consider this not agility! The longest jump we saw at Saturday’s competition was 23 feet! I am a fan of The Incredible Dr. Pol TV show and we did see Charles walking around with Athena (his black Great Dane), followed by the camera crew presumably taping for the show. 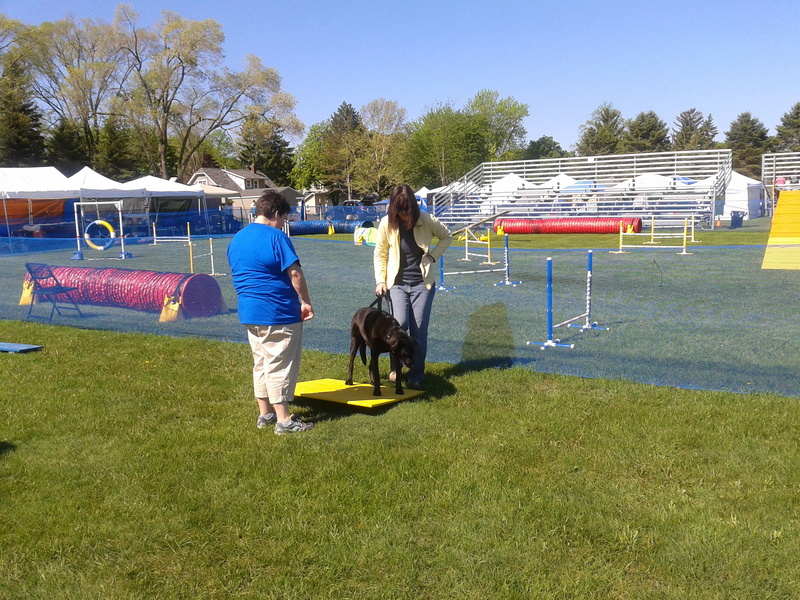 The were plenty of vendors there; Reggie made out with new treats from Grandma. I was very worried going into this day that Reggie could or would have a seizure because the weather is very nice here this weekend, and although we went earlier in the morning, he is black, he hasn’t shed fully yet, and it can get too hot for him. Also, this can be an extreme sensory overload kind of experience. But, success! Reggie was a champ! He was hot, he drank a lot of water (I made sure to bring water with me). The area where we were has a little man-made creek running through it and Reggie laid down in it to cool off at one point, which was funny to several onlookers. He met lots of dogs, as you can imagine, and everyone was super well behaved which was refreshing. 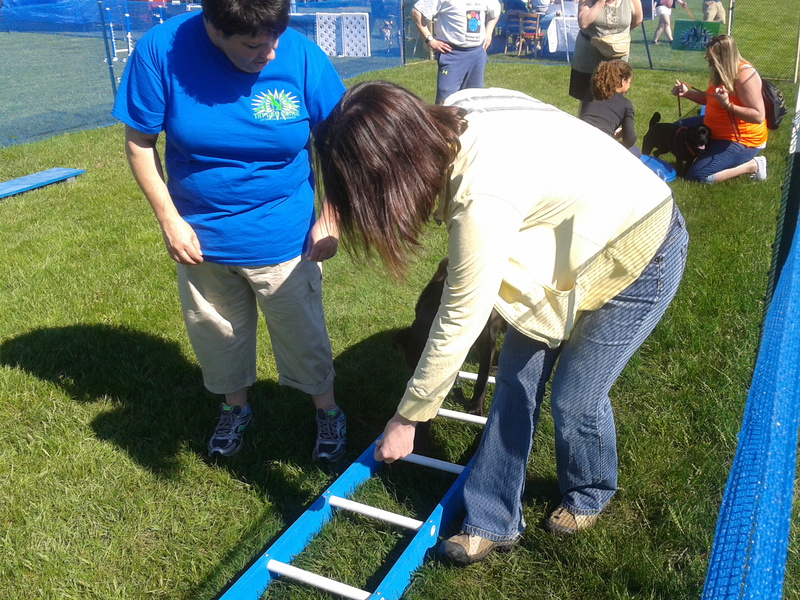 After a pretty stressful couple of weeks this was a great way to have some fun and see the dog Olympics- the Dog Bowl! I think we will definitely return next year. oh that’s so cool!! Congrats to Reggie for his agility skills. I’m jealous of the dock diving dogs since Zeke still won’t even doggie paddle much less jump in. Happy to hear Reggie was seizure free and everyone was well behaved. What a great event! It really was fun! Definitely a redo!